Welcome back to our Paw Province original holiday week, National Hermit Crab Week! Today we'll be discussing how to choose a pet hermit crab. I originally was thinking of posting about how to care for a hermit crab today, but I have so much to discuss today about choosing a hermit crab I decided to hold off on that for now. Before we begin, know that keeping hermit crabs is a big responsibility. They usually live around five years, so think long and hard before taking in one of these critters. Getting everything you need for a hermie might be pricey at first, but once you have everything you need there won't be much money to spend in the future. First, decide where you're going to be purchasing your hermit crab. It's actually recommended that you have more than one hermit crab because they are very social creatures that usually live in large colonies of over a hundred crabs. You should probably at least get two crabs, but three, four, five, or six wouldn't hurt if you have the space! Do lots of research about caring for a hermit crab before actually purchasing one. Often times, asking the employees at pet stores about caring for a hermit crab does no good. They usually don't have much knowledge in their care and just want your money. That's why you should do research, research, research, before getting a crab! When you go to the pet store to choose a crab, don't be surprised if the hermies aren't being kept in the best conditions. Fortunately, at my local Petsmart where I adopted my crabs, they were given decent care. Ask a store employee to allow you to hold the crabs. Large crabs aren't suited for new hermie owners. Go with a small, or at most a medium crab, instead. Some crabs you hold won't come out. Some might, but they might pinch, something normal for hermies when they feel threatened. You'll also meet some crabs who are not afraid to come out and show off. Those crabs are the most social and the more active the crab, the healthier. If you're choosing more than one hermit crab (which you should), choose crabs that are about the same size. Crabs will often be dominant and do little fights, and if a big one fights a small one, you know who'll win! It's normal for crabs to fight a little, but don't interrupt these fights unless you fear one will get very hurt! They will work it out on their own. 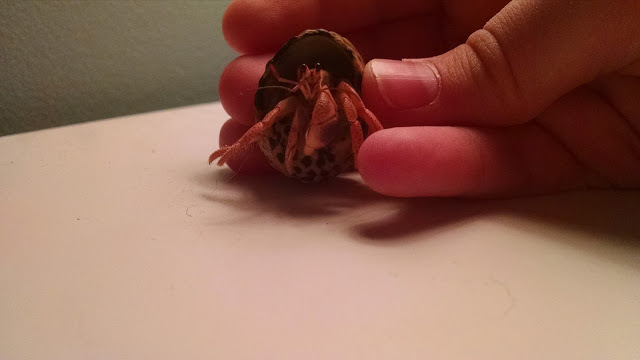 I hope this post has helped you learn how to choose a hermit crab as a pet! This is Brigadier the day we took her home. She is the type of crab that isn't afraid of anything and is a huge show off, so she's generally a healthy girl. I truly made a good decision by choosing sweet little Brig. Come back tomorrow to learn how to care for a hermit crab! Mum is off to Pets R Pups tonight, I will get her to look and see if they haf Hermit Crabs, they do sound interesting pets. Cool! Hermit crabs are wonderful little creatures. :-) The active ones are fascinating to watch. I read Sarge and the crabby girls' blog often! I'll let you in on a secret...I interviewed the girls and I'll be posting the interview tomorrow, so come back then for more fun! Goodness you are sertainly gorgeous and have a spectacular crabitat! We crabby girls admit we are not as outgoing as The Hands would like, but we have never pinched and are friendly whenever we are out-and-about. Why, thank you for the compliment, my crabby friends! I must agree that my shell is lovely! Perhaps later in the week we'll post a photo of our luxurious crabitat! Thanks so much for your kind words! I hope this week will inspire our readers to be captivated by the beauty and innocence of the hermit crab!